The Surface Go that is reviewed for this article is the one that has 8GB RAM, a 128GB SSD, an Intel Pentium processor, and an LTE modem. It’s sold for $679, but you can find deals for at least $50 less. The entry-level model, with Wi-Fi and 4GB of RAM, starts at $399. When I gave my first impressions review of Microsoft’s Surface Go LTE, I said that despite some of its flaws, I have a difficult time letting it out of my hands. After a couple more days of use, I’ve grown even fonder of Microsoft’s tablet, even though I have been an avid Surface Pro user for years. Let’s take a look. The Surface Go looks just like many would expect it to be – a miniature Surface Pro. Except, it’s more like an older version. The biggest flaw of the design is that the bezel space around the 10-inch screen looks like something straight out of the year 2015 (and three years in the tech world is like 30). However — looking at it from another point of view – the bezel space allows one to hold the tablet without worrying that their fingers will accidentally hit the screen. 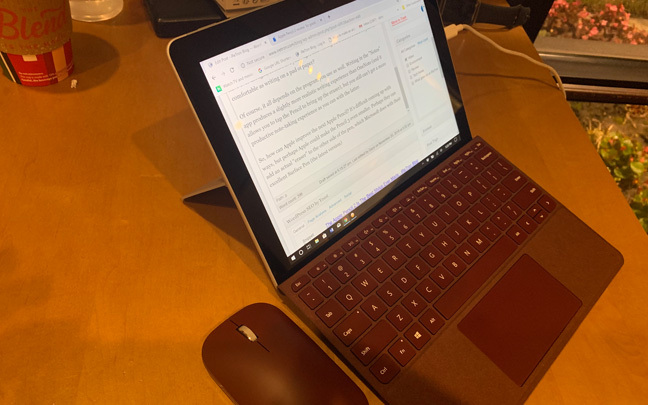 The Surface Go, weighing 1.15 pounds without the Type Cover, not only has a hinge that can bend 180 degrees, but also has rounded corners to make it feel more comfortable to handle. There is a USB-C port (not Thunderbolt 3 but still helpful) and a microSD card slot. One wonders how Microsoft was able to fit in all these things in such a small device. The Surface Go has a great screen. The 1,800 x 1,200 pixel resolution 10-inch screen isn’t as sharp as the Surface Pro’s, but it’s very good nonetheless, especially for a device that (in most configurations) runs $500 or below. The contrast ratio is very good, and the colors are well-saturated and accurate. 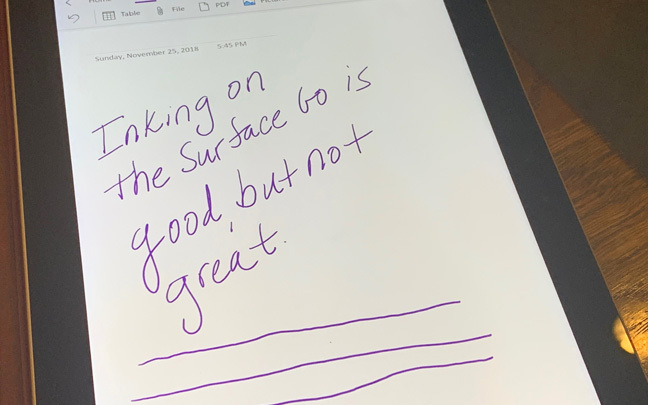 However, the Surface Go’s screen can get slightly washed out when looking at it from extreme angles. If you were expecting the Surface Go to have the same power as the Surface Pro, you are in for a major disappointment. The Surface Go runs an Intel Pentium Gold processor that can handle web browsing, movie viewing, and office tasks very well. But once you get into things like Photoshop (which does work, by the way), prepared to be slowed down…a lot. The Surface Go has been very good for my blogging activities, until I try and use graphics-intensive programs. Many compare the Go to the new iPad Pro. Even though Apple’s latest tablet is more powerful that the Surface Go, its mobile operating system cripples the device. The Go is shipped with Windows 10 S, but it can easily and instantly be upgraded to Windows 10 at no cost. The fact that it runs Windows 10 may be deceptive to those who are used to programs in this operating system running fast and smooth. But if you understand what you are getting into when purchasing the Surface Go, you won’t be disappointed with its performance. Oh, but you will be disappointed with the Surface Go’s battery life — even though it’s not a deal breaker. Just don’t expect to leave home without the charger! Microsoft promises “up to nine hours of battery life” on the Go, but don’t expect to get more than six. On average, expect to get about five hours of battery life per complete charge. This may sound disappointing, but the only way to get more battery life out of the Go would be to make a bigger device — thus, defeating the purpose of the Go in the first place. Perhaps Microsoft will find a way to optimize battery life when they release the follow-up to the Go. And they will, since the Surface Go is destined to become a hit. A regular Type Cover will run you $100, while an Alcantara cover will cost you $130. Anybody coming from the Surface Pro may have a hard time at first with the keys more cramped. 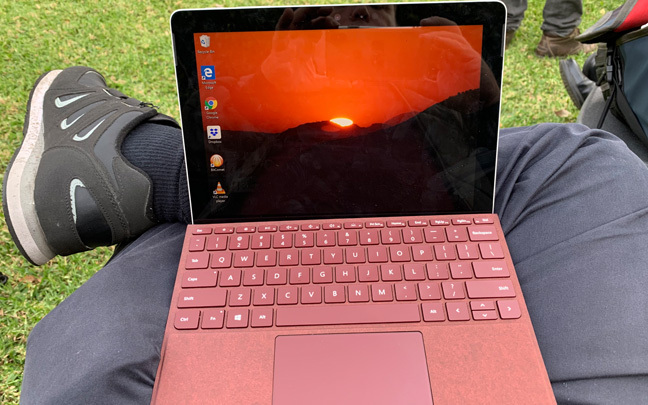 However, once you get used to it, the Surface Go Type Cover is more comfortable, in some ways, than even the Surface Pro’s keyboard cover. The keys have a plush feeling and the glass trackpad is fantastic. The Surface Pen, which costs $100, is certainly worth the price for the Surface Pro 6. Unfortunately, when it comes to the Surface Go, you get the same slight lag and pen jitter than you got on the Surface Pro 5 and earlier units. It’s good for taking notes, but don’t plan on using it for accurate drawings. Hopefully, a firmware update from Microsoft can improve things soon. Microsoft has finally delivered the “Surface Mini” that was always promised. Although the performance isn’t great, it’s perfectly fine for a $400-$600 device that you can easily fit in a purse or a small bag. The Surface Go isn’t a laptop replacement, and Microsoft doesn’t market it as one like Apple wrongly does with the iPad Pro. However, it is a great laptop companion and is the perfect device for those who feel that they have to go though too many hoops in order to do professional work and run professional programs on the iPad. Yes, Microsoft has delivered another groundbreaking product — even if it isn’t perfect.